A perfect mix of innovation in technology, changes in lifestyles and a desire to be connected all the time is creating the platform for wearables to become mainstream and play a larger role in personal and professional lives. Driven by the ability to interconnect with key modern trends of healthcare, fitness, messaging and socialization, the wearable technology market ecosystem is attracting significant levels of interest. One of the most popular types of wearables will be smartwatches, which will rule the entire 2016 and beyond as wearables give us more power, provide us with information that can help us live better and be more proficient. This article elaborates major advancements in wearable sensor technologies which are shaping its exponential growth and attracting both the end users as well as device maker to be the part of this exciting technology. As the name suggest wearable are worn by a user for an extended period of time and continuously remain on and connected. So a typical wearable device should have following attributes. 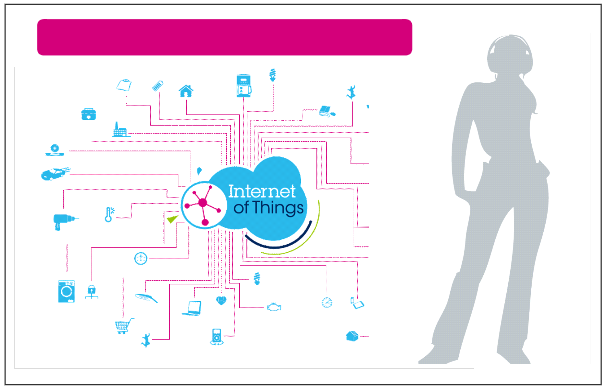 Wearables are continuously on the job and monitor or output key data for the user. They may have sleep mode but never OFF. As wearables are miniature devices and run on small battery they should consume ultra-low current. A wearable device which requires frequent charging will lose its purpose. The emergence of low power technologies has enabled the revolution in this industry. As they are worn by the user they should be small enough to take various usable and aesthetic forms. A bulky device will be an extra burden on the user and will lose its acceptance. Environment sensing is emerging as a key driver for wearable acceptance. Today wearable devices can monitor not only user activity information but also temperature, humidity, UV radiation etc. Wearable devices should be intelligent enough to filter out noise from the real data. They should be able to alert the user when any important information needs to be shared. For example, a security wristband should be able to send an alert when the user has met an accident or need SOS help. Connectivity is the most important factor for emergence and acceptance of wearables. These devices can be connected to smartphones or tablet using technologies such as Bluetooth, wifi etc. Besides, they can also be connected to GPS satellites to monitor user location. Traditional sensors provide the raw sensor data to the microcontroller to process and calculate useful information such as activity recognition. But this method leads heavy current consumption from Microcontroller to gather and process sensor data. The LIS2DS12 accelerometer has a dedicated internal engine architecture in order to process internally motion and acceleration detection including free-fall, wakeup, single and double tap detection, activity-inactivity, portrait and landscape detection, step counter and step detection along with significant motion detection. In this way, applications can achieve critical battery life as sensor data can now be processed inside the data itself. 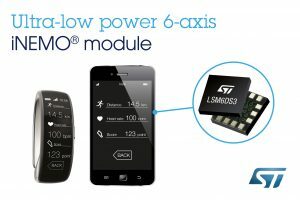 ST also has IMU sensors LSM6DS3 with integrated accelerometer and gyroscope. This sensor comes with an inbuilt pedometer and activity recognition. It also has inbuilt auxiliary SPI to connect the external sensor. Smart FIFO functionality allows storing up to 8K of data within the sensor itself so that communication interval with the process can be dramatically reduced. These features allow for superior performance and incredible power saving. ST has also introduced LSM6DSM IMU which can also control the image stabilization input to the camera sensor. In this customer doesn’t have to use an extra gyroscope to implement image stabilization.LSM303AH with integrated accelerometer and compass also comes with inherent smart functionality. 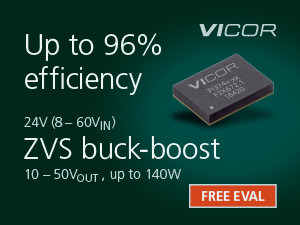 It gives superior performance such as embedded magnetic offset compensation, FIFO for accelerometer data and advanced power management features. Ultraviolet radiation exposure is fast emerging as a major cause of cancer around the world. So it becomes important to measure the quality and quantity of UV exposure. The UVIS25 is a digital UV index sensor able to provide an accurate measurement of the ultraviolet radiation index (UVI) from sunlight. It includes a sensing element and a mixed signal ASIC to provide the UV index data through I2C and SPI interfaces. 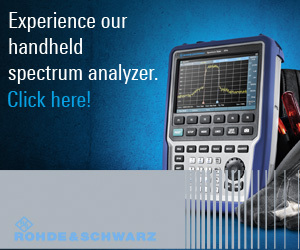 A dedicated technology has been developed to achieve the greatest accuracy for UV index measurements. The UVIS25 allows the measurement of the UV index, without the need for a dedicated algorithm to calculate the UV Index and without specific calibrations at the customer manufacturing line. The device can be configured to generate interrupt events based on a threshold crossing or when a new set of data is generated. It can use in a variety of products such as a smart watch, mobile phone, umbrella, glasses, clothes etc. The pressure sensor can detect earth’s atmospheric pressure. This feature can be used to implement barometer and altimeter. LPS22HB pressure sensor from STMicroelectronics is so accurate that it can even be used to tell the floor of building accurately. Humidity sensor can detect humidity parameter which can be used at the weather station, condensation level monitoring, air density monitoring and gas sensors measurement correction. ST has introduced a humidity sensor HTS221 which includes a sensing element and an analog front end to provide the measurement information by a digital serial interface. The sensing element consists of a polymer dielectric planar capacitor structure able to detect relative humidity variations. MEMS Microphone is an audio sensor that converts sound signals into electrical signals. MEMS Microphones are increasingly preferred over conventional microphones as they offer higher SNR, small form factor, digital interface, better RF immunity and high robustness against vibration. Microphone makes the interaction easier, faster and smoother. It also enables fashionable and stylish designs by reducing the number of buttons. Audio Amplifiers are needed to drive speakers for sound output for songs, communication or alerts. Highly-efficient audio amplifiers capable of delivering high-quality audio into small and low power devices is the desired feature in many wearable devices. Bluetooth Smart or Bluetooth Low Energy [BLE] enables low power connectivity to wearable devices. It enables two-way communications between wearable devices with hub devices such as a smartphone, tablet, laptop and dedicated gateways. BLE allows wearable devices to have an incredible battery life which is not possible using traditional wireless technologies such as WiFi and Classical Bluetooth. Bluetooth Low Energy works in license free 2.4Ghz ISM band. The standard is governed by Bluetooth Special Interest Group (SIG) and is support all the major smartphone brands. It is especially suited for low data rate applications such sensor data transfer and control signals etc. BLE also supports standard profiles such as Heart rate measurement, Blood Pressure, Health Thermometer, Alert Notification, Find Me, Proximity, HID etc. The standard profile allows hardware to be delinked from the Apps. So it is possible for a hardware offering standard profile to any smartphone and App which is utilizing same profile. The profiles are certified by Bluetooth SIG to ensure the compatibility. There are two major partitioning in BLE devices available. A network processor is a BLE device which is running BLE protocol including a controller, Host, and stack. But it needs a separate microcontroller for its functioning with the main microcontroller running BLE profiles and application. 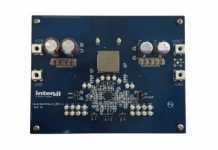 This platform is also platform independent so offers the wide flexibility to the user to select best-fit microcontroller or operating system. BlueNRG-MS is a network processor offered by ST and compatible with BLE 4.1. This IC can act as Master and Slave at the same time. So it is possible to have a Smart Watch acting as the slave to Smartphone but master of other wearable devices such as jewelry, smart shoes, heart rate accessory etc. System on Chip (SOC) is a device which is an independent chipset and includes a controller, Host, stack profiles, and application. It is specifically suited for simpler applications such as smart band etc which does require complex processing power and peripherals. BlueNRG-1 from ST is BLE 4.2 certified SOC and includes 15 GPIOs, I2C, SPI, UART, PWM, PDM and 160kb of RAM. This IC also offers advanced security and privacy features offered by BLE 4.2. As the wearable devices get smarter day by day the software complexity grows exponentially in order to manage all the sensor information.As the number of features increases, the possibility of and end-user misuse of the product increases accordingly.System crashes are likely to happen and it is mandatory to provide an escape sequence to restart the application and maintain a perception of quality and brand recognitions. 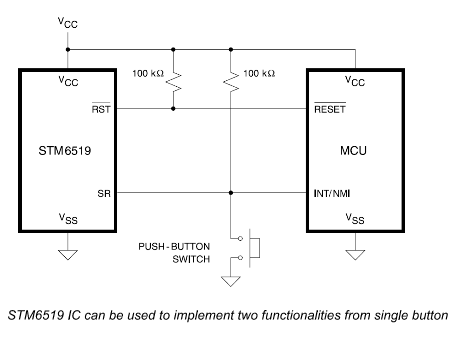 In wearable RTC not allows to keep the time but also helps in putting the system in low power mode according to time thus saving power.Low power operation and tiny package RTC is a required for battery powered and small form factor devices. M41T62 RTC from ST is the ultra-small package with embedded crystal and 350nA current consumption. Software libraries play an important role to convert raw sensor data into the meaningful use case. The algorithm augments the function of sensor beyond their stated features. The algorithm also combines the input from various sensors and create a context-aware output. The three motion sensors – accelerometer, gyroscope and magnetic compass – have their own advantages and disadvantages. 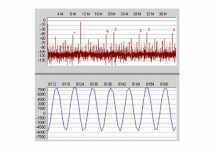 Sensor limitations include imperfect calibration, drift over time or temperature and random noise. Magnetometer and Accelerometer are subject to distortions and gyroscope has inherent drift. Sensor fusion library is used to calibrate their sensors with each other to create a condition which gives an accurate result in all scenarios. It not only give calibrated sensor outputs but also gives angle and heading angle information. Activity recognition library can take sensor data and inform the application if the user is a pedestrian, driving a bike or car. It can also tell if the user is stationary, walk, fast walking, jogging. A wearable comes in various forms such as a smart watch, smart shoes, smart glasses, armband, waist accessories etc. Similarly, a user can keep mobile in his front pocket, back pocket, shirt pocket, hand or on a table. So it is important for algorithms to know the carry position for it to work precisely. The carry position determination library does exactly this. A magnetic compass is a very important sensor to give direction sense but this sensor also very sensitive to hard iron, soft iron or angle of operation. Hard iron is the presence hard permanent ferromagnetic material in the vicinity of the sensor. It creates a permanent shift in compass reading. Soft iron is the presence of weak ferromagnetic material, circuit traces etc. It creates a variable shift in the sensor reading. So a magnetic sensor calibration library is used to filter out these anomalies. It is important for the library to do a fast calibration with minimum effort by the user. A pedometer library is used for step detection and step counting. The library should be accurate and smart enough to have a minimum error and consume minimum power. A smart pedometer library also uses activity recognition and carry position libraries as mentioned above. STMicroelectronics complements its advance smart sensors with smart software algorithm libraries to extract the best use of sensors and help the designer create world class products with minimum efforts. The wave of wearable is mainly driven by startups and young Engineers. Moreover, the market is evolving at such a fast pace that changing of success depends heavily on time and cost involved. It is very important to have a development platform which is open source, affordable, flexible, production ready and scalable. 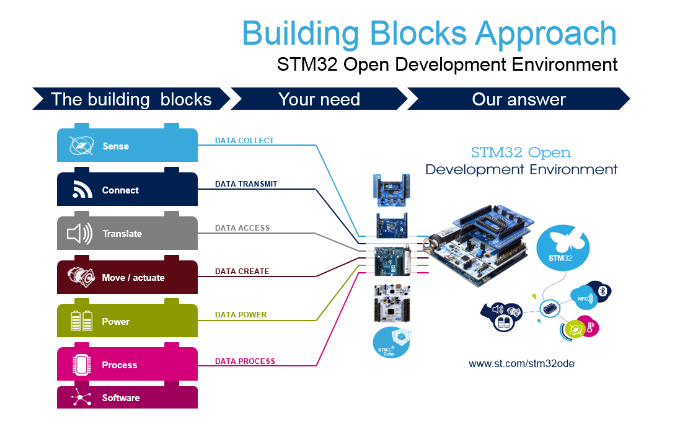 STMicroelectronics has introduced an STM32 open development environment platform which allows designers to develop products using ST microcontroller, sensors, RF and Analog products in a very flexible and affordable way. The hardware platform is complemented by software drivers, middleware libraries, and applications. It also includes associated Android and iOS code. The user can also access many advanced libraries by a simple computer-based license agreement. Once the platform is tested designer can develop his custom PCB and load the firmware developed on this platform. The user will need to sign the production license for libraries only when he want to test on his custom board. Wearable has the potential to change the world just as the internet did. Smart Sensors and BLE have empowered devices with the power of sensing and communication to take complex decisions.Wearables will create fundamentally new use cases and will do things which even smartphones cannot do. It is expected that healthcare and fitness will emerge as the largest category for wearable. STMicroelectronics offers one stop shop for all semiconductor requirements in this space and allows for users and entrepreneurs time to market with driver and library support.